Matmor process is an iron making process which is presently being developed by Environmental Clean Technologies Ltd (ECT). Matmor process technology is a patented technology. The technology is based on lignite coal and is capable of replacing high-grade lump iron ore with lower-cost alternative raw materials because of its unique chemistry and furnace design. Normally lignite coal (also known as brown coal) is not used for metallurgical applications because of its high volatile matter and moisture content. Environmental Clean Technologies Ltd is the owner of the Matmor process technology, including plant, equipment and intellectual property (IP). 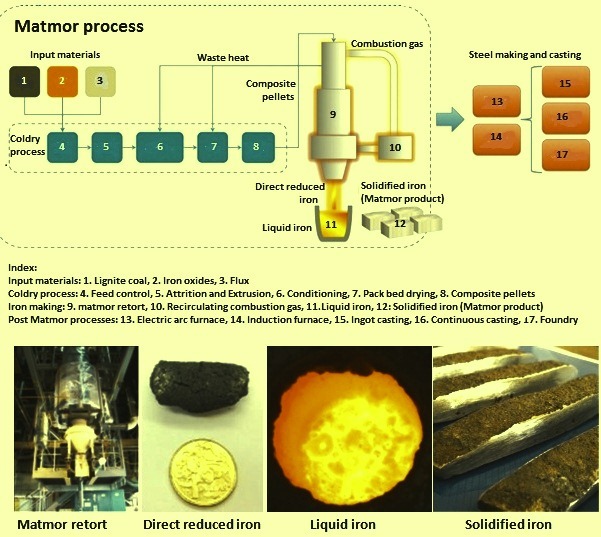 The Matmor process has placed itself to revolutionize primary iron making process with a design consisting of a simple, low cost, low emission, and patented Matmor retort using cheaper, alternative raw materials. This technology comprises two exclusive features namely (i) it uses lignite coal as a reductant and heat source which is not claimed as of now by any other technology, and (ii) it includes in its plant design, a vertical shaft furnace which works with the natural chemistry of the lignite coal. 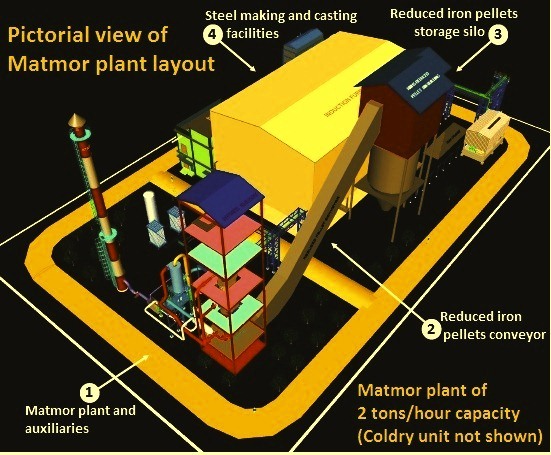 The development of the Matmor process is based upon the removal of moisture by Coldry technology another patented technology of the Environmental Clean Technologies Ltd and the harnessing of the natural chemistry pf the lignite coal through a process and a vertical retort furnace whose design and process chemistry is different to those of a blast furnace. The process chemistry of the Matmor process utilizes hydrogen as a reducing gas, enabling lower operating temperatures and shorter process times than countered in the iron making by blast furnace. Though the Matmor process technology is individually attractive, its combination with the Coldry technology has higher attractiveness since both the technologies when together are able to leverage lower value resources (lignite coal and iron ore tailings from the iron ore mines) to produce higher value, diversified outputs such as iron and iron alloys in addition to the thermal coal product of the Coldry process. Matmor process technology is a method of producing high-quality iron from lignite coal and iron oxide bearing materials such as mill scale, nickel tailings as well as high or low grade iron ore. The output of the process is clean iron product whose size/shape and carbon content can be controlled to meet the requirements of the end user. Iron product produced by the Matmor process is a high quality substitute for, or supplement to, scrap metal feedstock used in electric arc furnace or induction furnace. The first step of the Matmor process is the preparation of the raw materials. This process step uses Coldry technology for the preparation of the raw materials. As done in the Coldry process, the raw materials consisting of coal, iron oxides and flux are ground to less than 8 mm. The ground material is combined with a small amount of water, mixed and extruded. The extruded mixture is conditioned till it is dry-to-the-touch. The semi-dry pellets are conveyed into a vertical packed bed dryer, where warm air provided by waste heat is circulated through the pellets for the removal of the evaporated moisture. The composite pellets are discharged at the base of the dryer and are conveyed to the Matmor retort. The composite pellets are self-reducing and self-fluxing. In the second process step oxygen of the iron oxides is removed in a Matmor retort which is a vertical shaft furnace. The composite pellets produced in the first step are charged at the top of the Matmor retort. The atmosphere in the retort is of reducing nature. The pellets are heated in the retort in this reducing atmosphere. As the temperature of the pellets increases, the remaining moisture is evaporated and the coal volatiles are driven off as combustible gas. This combustible gas is recirculated into the base of the retort, where they are ignited, providing an effect similar to that of a blast furnace. As the composite pellets travel down the centre of the retort, reduction reactions take place which removes oxygen from the iron oxides. The hot reduced pellets are discharged at the base of the retort. These hot pellets contain carbon, iron and ash. Hot air or oxygen is injected which burns off the remaining carbon and raises the temperature of the pellets past the melting point of the iron to produce liquid metal and slag. The liquid metal is either cast into pig iron or can be directly taken to the steel making furnace. The Matmor product is a clean iron product and the process parameters can be adjusted to produce a product which meets the specifications of the size/shape and carbon content as per the requirements of the end user. The typical composition of the iron produced by the Matmor process is Fe – 98.94 %, C – 1 %, Mn – 0.02 %, and S – 0.03 %. This Matmor product has been produced from the quality of input materials as given in Tab 1. The Matmor process, the Matmor retort, and the Matmor product are shown in Fig 1. It replaces expensive metallurgical coal with lignite coal which is cheap and available in plenty. Presently it is the only known process to use lignite coal as a reducing agent. The process is capable of using cheaper, low grade iron ore thus replacing expensive high grade iron ore with Fe content of 60 % minimum. The process adds value to the low grade coal and iron bearing waste material. It also improves energy and resource security by decoupling from coking coal and high grade iron ore. The process is able to recover iron containing waste materials such as mill scale, mining rejects, iron bearing sludge, and other Fe containing waste materials. Since temperatures are low, the process needs considerably lower heat and hence it saves energy. The operating temperatures are lower than 1000 deg C.
The process has low capital cost since there is no necessity to install coke oven battery and sinter plant. It is also economical at small scale of operation. The process has lower gas emissions because of the recirculation of waste gases. The chemical reactivity of the lignite coal which is used as a reducing agent in the process is up to 1000 times higher than the black coal presently being used in other primary iron making processes. The process produces a high quality of iron product which can be used in the steel making process as replacement of steel scrap. Environmental Clean Technologies Limited has now signed an agreement with NLC India limited (NLC) and NMDC Limited (NMDC) to proceed further with the process development. As per the Master Project Agreement (MPA) signed in May 2018, (i) Indian partners will contribute 100 % of the project funds (around 35 million Australian dollars), (ii) a Special Purpose Vehicle (SPV) will be created upon completion of the research and development (R&D) phase of the project, with the ownership of ECT – 49 %, NLC – 25.5 %, NMDC – 25.5 %), (iii) global licensing rights will be granted to the SPV, excluding Australia, and (iv) future royalties will be disbursed to the partners according to the SPV ownership percentages. The MPA has authorized ECT to establish the world’s first Australian designed Coldry and Matmor plant in Tamil Nadu state, India to diversify the use of lignite coal in the generation of electricity and to include the production of steel at lower cost with significantly lower CO2 emissions. Commencing with an 35 million Australian dollar R&D phase, the project aims to scale up ECT’s Matmor and Coldry technologies to deliver an integrated Coldry demonstration and Matmor pilot plant to validate their technical and economic feasibility at a capacity of around 2 tons per hour of metal. The pictorial view of the plant layout is shown in Fig 2. At present the basic design of the plant has been completed.